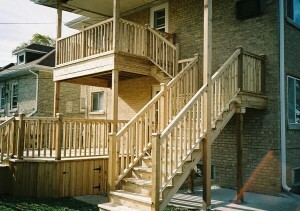 The best Chicago deck contractor for over 45 years. There's a reason Chicagoland has trusted Randy Jaacks Rustic Woodmen Decks for nearly half a century: our work speaks for itself! Based out of Niles, IL, our Chicago deck contractors have been constructing beautiful, durable, and long-lasting decks and outdoor structures that can enhance the look, feel, and functionality of any home. The expert Chicago deck builders at Randy Jaacks Rustic Woodmen Decks use only the highest quality materials, crafting wonderful home additions known to last decades and withstand even the harshest weather conditions. Famous for our gorgeous custom cedar decks and patios, we proudly offer deck building and design in a complete variety of materials and styles, including composite decks and ipe decks, as well as complete pool deck solutions. Randy Jaacks Rustic Woodmen Decks also constructs other backyard structures, like gazebos, screen rooms, pergolas, and trellis. If you're ready to add a beautiful new rustic deck to your home, or if you'd like more information on any of our Chicago deck installation services, simply fill out the form below to contact one of the professional contractors at Randy Jaacks Rustic Woodmen Decks!